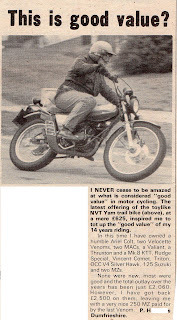 "I NEVER cease to be amazed at what is considered "good value" in motor cycling. The latest offering of the toy like NVT Yam trail bike (above), at a mere £625, inspired me to tot up the "good value" of my 14 years riding. 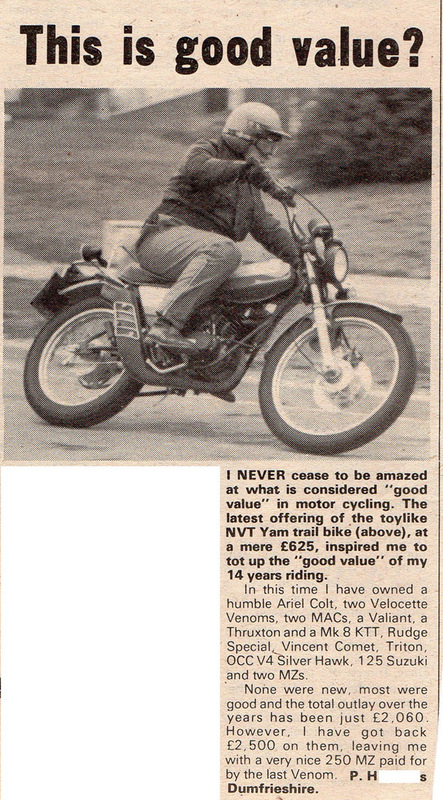 In this time I have owned a humble Ariel Colt, two Velocette Venoms, two MACS, a Valiant, a Thruxton and a Mk 8 KTT, Rudge Special, Vincent Comet, Triton, OCC V4 Silver Hawk, 125 Suzuki and two MZS. None were new, most were good and the total outlay over the years has been just £2,060. However, I have got back £2,500 on them, leaving me with a very nice 250 MZ paid for by the last Venom." Taken from a bundle of press cuttings bought on eBay for a couple of pounds.